We begin this week in the wake of the Full Moon, and just as we start feeling our stomachs settle, Mercury squares Neptune & Co., forcing us to face any remaining fears. If you are feeling the shift that has taken place, you also may feel the pace speeding up. Energy moves into matter in a set process, and I sense it happening, although so far I’m mostly seeing hints of results, but not much that is tangible. For the past few weeks, I’ve been feeling old energy patterns clearing out. This may involve letting go of people, places, or possessions that are dear to us, which can be a painful process. The Full Moon is a good time for endings, so get rid of what no longer supports or feeds you, and clear that space for something or someone who does. Venus is now in her own sign of Taurus, and on Monday she trines Pluto in Capricorn. Venus-Pluto contact can bring out jealousy and possessiveness, but trines are among the easiest aspects to deal with. In earth signs, the more sensual nature of this combination will be felt. You may have noticed it over the weekend. Other than that, the rest of the week is mostly about the ongoing conjunction of Jupiter, Chiron and Neptune. On Tuesday and Wednesday, Mercury forms a square with all three, the third and final pass in a three-part aspect that began on April 25, before Mercury went retrograde. With the Messenger now direct and gathering speed, this square to Neptune & Co. should feel very different than the last two. If we’ve been operating without all the information we need, the facts finally will come to light. For some of us, the truth that emerges may be unpleasant or uncomfortable. Still, there is a good chance that these new facts may just as easily liberate us, as Mercury also sextiles Uranus, the planet of freedom, which is in mutual reception with Neptune. For many people, holding onto a dream can become a burden. We also can cling to just plain wrong ideas about people and situations, which may in turn cause us to act in a way that isn’t consistent with reality. We may have to eat our words or apologize profusely, but once it’s over with, we’ll feel lighter. The Moon enters Aquarius on Thursday and goes back over this same territory on Saturday. However, whereas Mercury is more rational and logical, the Moon looks through the lens of emotions. Thoughts and feelings are two different perspectives on the truth. Honor your own feelings and those of others. My advice to myself during this internally turbulent period has been to remain as detached as possible from any particular outcome, and likewise not to fear a certain outcome. When we brace ourselves for being hurt, we close up our hearts and shut out the good that can come. Or we fail to see the blessings in disguise. Sometimes losing something turns out to be the best thing that ever happened to us. 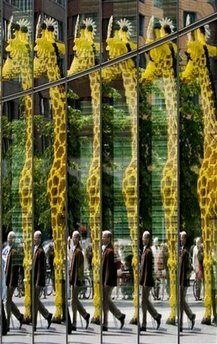 Image: This mighty big illusion was created by the reflection in a window of a man passing a giraffe Lego sculpture in Berlin, Germany. Photo by Maya Hitij for The Associated Press. This entry was posted in About astrology, Forecasts, General Musing on June 8, 2009 by Pat. I really need to stop putting some on a pedestal. Really, really.